EZ Mount THIN STATIC CLING MOUNTING FOAM Sheets Black 133884 at Simon Says STAMP! 133884 This item is on reserve until If you would like to reserve this item now, you may purchase it now with the rest of your order. We will hold your order now and ship your entire order as soon as this item is back into stock. If you would like your order to ship now, please place this item on a separate order. Success, EZ Mount THIN STATIC CLING MOUNTING FOAM Sheets Black 133884 has been shared! A Thinner version of our EZMount Cushion (1/16 inch Thick). The perfect solution for small stamps or stamps that come already mounted to a double sided adhesive foam. Allows you to make any rubber stamp into an EZMount stamp that clings perfectly to an acrylic block. No sticky mess and never wears out. It is not recommended you store any of your EZMount stamps on acetate sheets. Acetate is made with chemicals that react with EZMount and other cling cushion type product, making it almost a permanent bond between it and the cling. You will receive one sheet measuring approx. 8.5 x 11 inches. 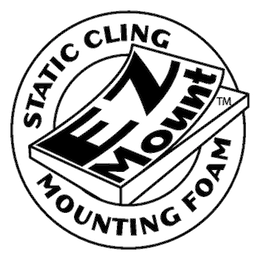 This premium cling mounting cushion is used to mount your rubber stamp sheets so that they can be used with acrylic blocks. One side has adhesive for permanently mounting your rubber sheet and the other has a static cling coating that bonds temporarily to an acrylic block for use. EZ Mount is the perfect choice for those who want to save room in storing their stamps. Remove your old wood mounted stamps and apply EZ Mount to the backs to transform your old, hard to find collections into a slimmer, easy to find solution!